Caeleste was established in 2006 by Bart Dierickx and Patrick Henckes. Bart was previously CTO of Fillfactory, which was a spin-off of imec in the field of image sensor design and manufacture. Patrick was already a serial entrepreneur before joining Caeleste. Caeleste is a design and production house for image sensors. Caeleste design and make custom designed products. When customers come to us, we listen to their requirements and based on our experience, we start drafting the specifications and the architecture for an innovative product, which in many cases will result in great overall performance and will also have cost-saving benefits. Caeleste is not limited to sensor design alone; quite often the company also looks at the problem from a system perspective and how the image sensor can help in making the overall system more performant and cost effective. When mentioning image sensors, most people automatically think about sensing visible light. 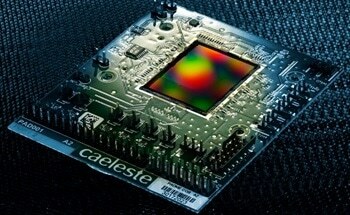 But there is much more beyond the visible: Caeleste also makes image sensors capable of imaging in the Near Infrared (NIR) field or in the UltraViolet (UV). The company goes also further and makes image sensors for X-ray applications and for the detection of high energy particles. Together with our partners we also contribute to the design and manufacture of Infrared Focal Plane Arrays (FPAs). More and more, we are also supporting the life science community with neuron potential measurements and stimulation devices.